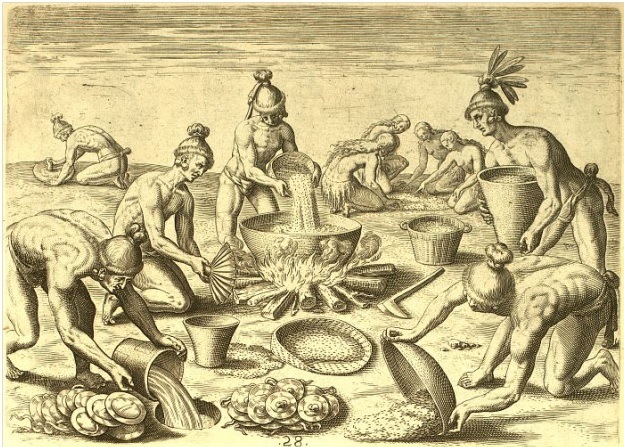 The Timucua, as depicted by Jacques Le Moyne, prepare a feast. Daily Timucua life centered on the hunting and gathering of food. Near and along the coast, early Floridians gathered edibles, such as berries and oysters. They also hunted and fished. In addition, they farmed on a limited basis, growing corn, beans, squash, pumpkins, and sunflowers. Consider what they ate. How many of the following things might you enjoy today? From all of these plant products, the Timucua prepared jellies, teas, gum, bread, fritters, dumplings, grits, seasonings, sweets, raisins, and prunes. EASTSIDE and WESTSIDE – On the east side of the St. Johns River, Timucua villages stood in an area of generally sandy soil. This wasn’t very conducive to raising crops. Therefore, gardens tended to be smaller, and Indians depended more on gathering wild plants. The Timucua villages on the west side of the river, however, benefited from a richer soil. They found it easier to grow their food. 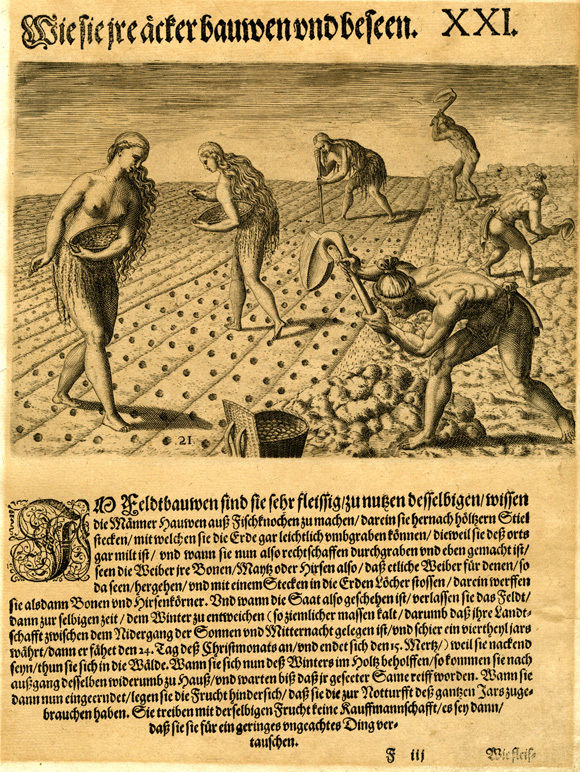 Mode of Tilling and Planting. Transcription taken from Discovering the New World, Based on the Works of Theodore de Bry (1591), edited by Michael Alexander (New York: Harper & Row, 1976). The Indians cultivate the earth with diligence. They have learnt to make hoes with fish bones and to fit them with wooden handles. With these they can dig the soil quite easily as it is not heavy. Once the earth has been well broken up and leveled, the women sow beans or millet or maize. To do this they are helped by people who precede them with a stick, and make holes in the soil where the grain or bean or millet is thrown. The sowing completed, they leave the field alone. It is, in fact, then their winter season which is quite cold in this region and which lasts three months, from 24 December to 15 March. Being always naked, the Indians then seek shelter in the forests. The winter over, they return to their houses, anticipating the ripening of the crops. The harvest gathered, they store the corn for the year’s uses, and do not trade with any of it except perhaps for some exchange of household articles. PREHISTORIC GARBAGE DUMPS — Suppose you were a Timucua and you didn’t care for shellfish: Your neighbors would probably have considered you a finicky eater! Shellfish were consumed primarily by the Timucua who lived along the coast and the inland rivers, including the St. Johns. Over time, these early Floridians ate countless tons of such shellfish as oysters, snails, crabs, clams, and mussels. They piled the debris in middens. These are trash heaps that contain shells, bones, broken pottery, etc. Some of mounds are massive, and there were lots of them. Middens used to blanket parts of Florida’s East Coast, from Cape Canaveral northward. During the 1800s, in fact, Americans couldn’t believe their eyes. They couldn’t comprehend that human activity had created so many mounds. Numerous middens, though, have been cleared away. Shell miners have used them for roadbeds and other purposes. This situation has been ongoing since the late 1800s. Federal and state laws, however, now prohibit the disturbance of middens on public lands. Unfortunately, those on private property are still fair game. LOCAL TRASH HEAPS — Many middens still remain on Fort George Island in Duval County. Take a trip over the winding road that runs to the Kingsley Plantation house. Some mounds will be visible from your car. One easily reachable midden is the double mound in Arlington. It’s located near Fort Caroline Road, in the Theodore Roosevelt Area of the Timucuan Ecological and Historic Preserve. This midden covers about 25 acres and stands 25 feet deep with oyster shells. There are four shell mountains in the immediate area, and they date from 600 to 2,500 years ago. MAD ABOUT OYSTERS — If they returned today, the Timucua of the Jacksonville area would probably frequent oyster bars. They went wild over oysters, whether raw, boiled, or roasted. Among Jax area Indians, oysters proved by far to have been the favorite shellfish. We know this because of what is uncovered in local middens. Along the St. Johns River from downtown Jacksonville to the sea, middens are mostly made from oyster shells. South of Palatka, on the other hand, it’s a different story. Snail shells are the principle component of middens. OTHER TRACES OF THE TIMUCUA — Middens are not the only evidence of long-gone Indian life in Jacksonville. There are more than 300 known Indian sites just in Duval County. These include burial spots, Indian villages, Spanish mission villages, and temporary seasonal camps. Also found are old places where tools were made and food was prepared. Some Indian sites sit in fields, forests, and backyards. Others have been paved over. These include locations at Pointe La Vista near San Jose Boulevard; sites at the Colony Cove and Brittany Bluff subdivisions on Mill Cove; a site at the federal courthouse downtown; and a site at a Mayport Road convenience store that’s on part of the old Mayport Mound.